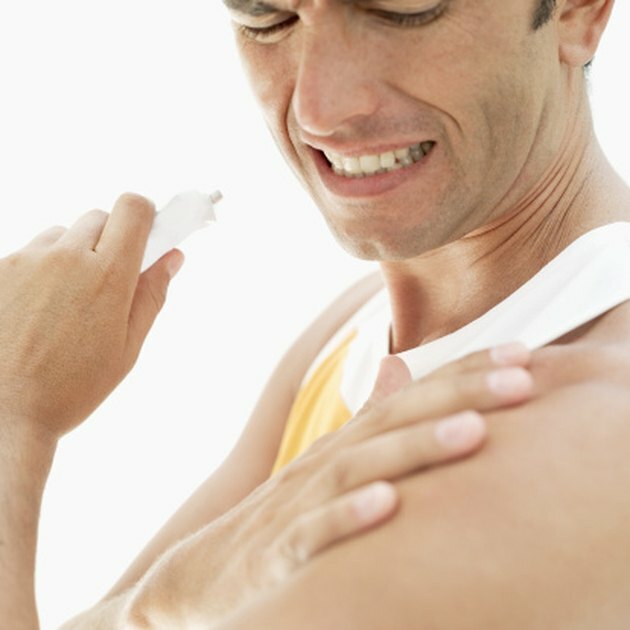 You've just finished an intense workout session, and you know the next day, it's coming: muscle soreness that gives you the familiar twinges of muscle pain the day after a workout. All things considered, most muscle soreness is your body's positive response to growing stronger. However, if you don't learn how to deal with muscle soreness, it could lead to injury. Not all forms of muscle soreness are the same. Two types exist. The first is immediate muscle soreness. This is the kind that you feel during or immediately following exercise. The second kind is delayed onset muscle soreness, or DOMS. This is when soreness develops 24 to 48 hours after you exercise and typically ceases about three days after exercising. Immediate muscle soreness indicates your muscles are tired after a tough workout while DOMS means you exercised intensely enough to develop tiny tears in your muscle. When these tears are rebuilt, your muscles can become larger and stronger. Experiencing DOMS has some benefits. For example, DOMS indicates your muscles are changing and growing larger. Exercise is not enough to grow stronger -- you must exercise at an intensity level that is enough to be challenging. DOMS is an indicator you are accomplishing this. "Although DOMS is associated with something negative, it's actually a physiologically positive reaction," according to Dr. David J. Szymanski, director of the Applied Physiology Laboratory at Louisiana Tech University, interviewed in "Running Times" magazine. "Once your body is exposed to whatever made you sore, the next time your body will say, 'I got it, I'll protect you.'" A fine line exists between exercising at an intense pace to build muscle and exercising at an intense pace to lead to injury. Increasing your exercise session too quickly in intensity, frequency or duration can lead to muscle soreness that increases your risk for strain and injury. When you experience DOMS, do not perform the same challenging workout the next day. Failure to rest can further tear the muscles and lead to injury. If your muscle soreness is accompanied by a feeling of weakness or instability, this can indicate an underlying injury. To find the right balance between good and bad muscle soreness, challenge yourself in your exercise routines, but challenge at a reasonable pace. Increase your exercise duration between five and 10 minutes every month and increase weights for resistance training by 2 to 5 lbs. when you are able. This will give your muscles time to acclimate to a new challenge before taking on another. Resting between weightlifting sets also can help to reduce muscle soreness.